I recently got an opportunity to hear about the small cell deployment studies, organised as SCWS pre-conference workshop. The combined slides from the presentation are embedded below and available to download from Small Cell Forum page here. Earlier in March, I helped organise 'The Gigabit Train' seminar'. The intention was to look at the connectivity options inside the trains and its monetisation. While connectivity in the trains is challenging, thinking back about it, due to a predictable route it can be sometimes easy to deploy. It could be more of a challenge for cars and buses that go through unpredictable routes and conditions. I also discussed the "Vehicular CrowdCell" or "Vehicular Small Cell" concept here to look at some advantages of such a solution option. Some of you may be aware that I recently joined Parallel Wireless. We were selected by M1 Limited, Singapore’s most vibrant and dynamic communications company, to support its WiFi-On-The-Go service as a part of the HetNet trial. This is the architecture of the On-Bus Hetnet. Some of you would find it self-explanatory. 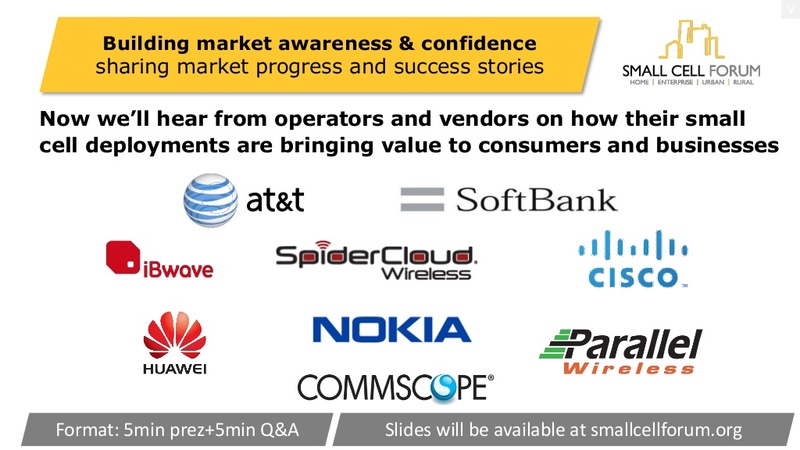 The mobile operators in Singapore are looking for innovative technologies to address spectrum scarcity as subscriber demand is growing rapidly with smartphone penetration reaching 130 devices per 100 people. Maximizing utilization of the spectrum and easing network congestion in areas with heavy human traffic is necessary to meet Infocomm Development Authority of Singapore (iDA) vision of connecting the whole nation as a part of world’s-first Smart Nation initiative. Real-time HetNet orchestration and traffic prioritization is made possible by HetNet Gateway (HNG). 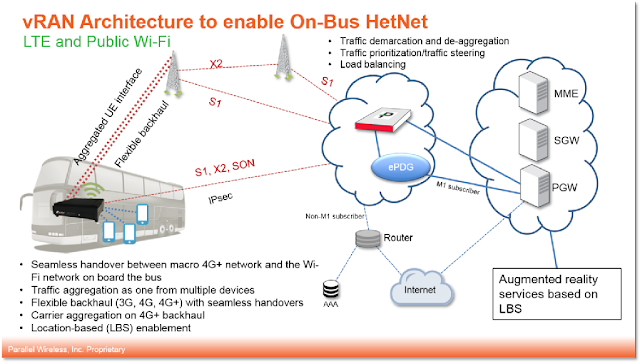 All bus riders receive seamless, high throughput connectivity from an on-bus multi-mode LTE/Wi-Fi Converged Wireless System (CWS) small cell with integrated backhaul including licensed assisted backhaul. By enabling carrier aggregation for backhaul, the end user throughput can be increased 10 times (up to 300 Mbps) allowing transit passengers to enjoy multimedia content without buffering. Q: Does seamless handover are available with no drop in data throughput through out the travel route of Bus? A: Yes, handover is seamless, no dropped data or voice calls. This was one of the iDA trial requirements. We can do seamless VoLTE to VoWiFi handover and back. Q: What is the maximum data rates does the system accommodate for all seamless data transfers? Does the system support motion video play from N/W. If so of what bandwidth and data rates? 4. How many users does the system support and what data rates? A: It will depend on the backhaul. We can increase backhaul capacity with CA on 4G + to 300 Mbps shared bandwidth. Q: This seems to be a relay device ( a femto or pico grade small cell with UE backhaul). an their innovative hetnet gateway for traffic engineering ( LBS support ). A: Our in-vehicle unit is a Small cell (LTE/Wi-Fi for access) with any backhaul incl UE backhaul. The HetNet Gateway, in addition to performing 3G, 4G, WI-Fi gateway functionality and real-time SON with ICIC, will also do the traffic engineering.